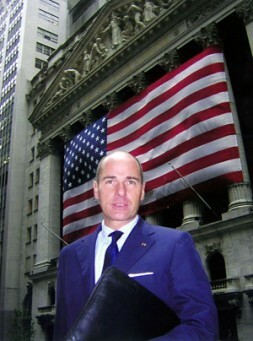 German entrepreneur and geo-strategist Dr. Hubertus Hoffmann, Founder of the World Security Network Foundation, at the New York Stock Exchange on Wall Street: "2010 was a year of crisis in self-discovery for bankers in New York and around the world, suffering sleepless nights due to fear of a repeating crisis (double-dip), job loss and a collapse of the euro. It was a year of crisis in the hedonistic American way of life of unrestrained optimism, maximum consumption, and the feeling of superiority and lack of respect for others. The elite on Wall Street must go from being a selfish elite to a responsible elite, they have to grow up. The eternal dance around the "Golden Calf" - here one would more appropriately say the "Golden Bull" in front of the New York Stock Exchange - is "out". Self-discovery is "in"." 2010 has been another year of growth, yet accompanied by higher unemployment but strong stock markets. The powerhouses of the world economy were China as well as India and Germany in "Old Europe". Next year we will see stronger impulses in the United States with as well high liquidity. As is usual, any third year of a US President will be quite good on Wall Street. After the excesses of greed and compulsive gambling with huge sums and other people's money, the soul of Wall Street remains yet unhealed. Eternal optimism is dead and must now be placed on a scale alongside skepticism to be weighed anew again and again. Thus, Wall Street has returned to a more reasonable basis, more people have rediscovered the eternal value of healthy common sense; some have even become more modest. 2010 was a year of crisis in self-discovery for bankers in New York and around the world, suffering sleepless nights due to fear of a repeating crisis (double-dip), job loss and a collapse of the euro. 2010 was a year of crisis in the hedonistic American way of life of unrestrained optimism, maximum consumption, and the feeling of superiority and lack of respect for others. The eternal dance around the "Golden Calf" - here one would more appropriately say the "Golden Bull" in front of the New York Stock Exchange - is "out". Self-discovery is "in". At the forefront is not only the question of the meaning of life but of a new orientation, the appropriate mix of greed, lust for live, happiness and satisfaction, a balance between materialism and idealism. The slippery, arrogant Gecko-type on Wall Street has become a self-parody and is forlorn and lost. The drug "U.S. Dollar" made too many dependent and unhappy like cocaine addicts. The latest PNAS study of the University of Southern California in 37 countries showed that more income and GNP does not produce more happiness after you have reached a basic level of living; and that people in the U.S. are not happier than those in poorer countries in Africa or Asia and the population in China is even a little less happy now after the income doubled in ten years. More cash does not mean more happiness. New York as gone through phases of greed and has, like Gecko, conformed to the zeitgeist. How creative the 1970s and 1980s were and how compliant the extremely greedy 1990s and the boom-years until 2008 , where a house in the Hamptons and a private jet were the measure of all things and of social acceptance. Now at the beginning of 2011 America is at a turning point in its way of life and zeitgeist. Prosperity is growing in Shanghai and Mumbai, the optimist is a Chinese, the best car is German and one's own private home in the US is hardly affordable. Every tenth American is unable to find work and frustrated. The quality of most US products, with the exception of a few like Apple and Microsoft, is no longer competitive. Streets have ever-larger potholes, airports and railways are falling behind compared to Europe and China, and the national debt is exploding also due to the fact that Washington is barely able to shoulder the burden of two wars. The USA is a global power on the way down poisoned with huge public and private debt. China's ascendance tears at the Americans' feeling of superiority, combined with the fact that the world cares less and less for that which the White House desires including allies in Europe, Asia or the Gulf or Israel. America's soul is suffering, not because of Barack Obama, but due to unbridled, New-York-style capitalism. It brought the nation to the brink of financial collapse, and very nearly the rest of the world along with it. The core of this psychological crisis is also the intruding minute-by-minute mega-propaganda on American TV, newspapers and billboards: "Buy, consume and be happy! ".Consumption intoxication has for too long been American-style hedonism and their souls are empty. Money and consumption don't provide happiness. Less is more. Have you learned your lesson Uncle Sam? And traditional values like humility, frugalness and honesty. The elite on Wall Street must go from being a selfish elite to a responsible elite, they have to grow up (see www.worldsecuritynetwork.com/fritzkraemer). The roots of social responsibility and religious care for one's fellow man must be reawakened in each one of us. Mentors of responsibility are needed, but where are our role models? It isn't someone else or a banker or a politician, rather each one of us. We are the small drops of water from which a trickle becomes a river and then can and must become an ocean of responsibility. The Founding Fathers of America thought and acted in precisely this way: they were not turbocharged egoists and capitalists; rather, they were committed to a new strength of a mixed tolerant nation anchored in belief with a maximum degree of freedom. They were not against everything (like the tea party) but rather for new great ideas and tasks. Back to the roots America! Heal your soul ! Reduce your debt! Modernize your country! Learn from the best practices in the world including Germany. The team of the World Security Network Foundation wishes all of you a Merry Christmas and a very Happy Holiday Season.